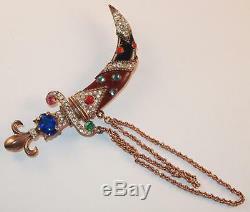 This wonderful vintage 2 part figural brooch measures 3 3/4 long with the dagger inside the sheath. The dagger and sheath are two separate pins connected by two chatelaine chains. It was patented by Murray Slater for the Urie Mandle jewelry co. Both pins and chains are sterling silver with rose gold vermeil. The dagger measures 3 1/2" long and the handle is 1 1/4" wide. It is marked "Sterling" in two places on the back. It's in excellent condition. The sheath measures 2 1/2" long x 1/2" wide. The chains are 5 long. 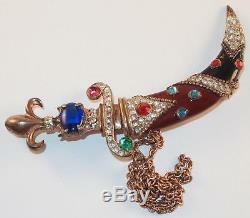 The dagger is jeweled with blue, pink, and clear rhinestones and has a fleur de lys handle. 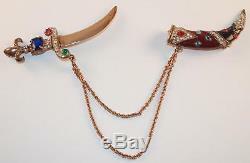 The sheath has black and reddish brown enamel and is decorated with red, blue, and clear rhinestones. It's marked "Sterling" on the back. 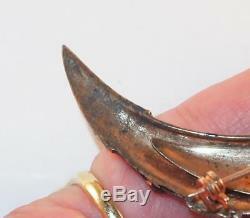 There is one tiny spot of wear on the black enamel and one clear rhinestone missing from the tip of the sheath - see pics. 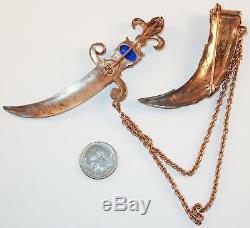 VINTAGE STERLING SILVER URIE MANDLE MURRAY SLATER DAGGER BROOCH CHATELAINE PINS. A wonderful vintage designer figural chatelaine brooch to wear and add to your vintage jewelry collection. 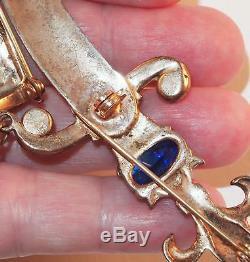 Please see our other antique and vintage jewelry also just listed. Auctiva offers Free Image Hosting and Editing. The item "VINTAGE STERLING SILVER URIE MANDLE MURRAY SLATER DAGGER BROOCH CHATELAINE PINS" is in sale since Friday, August 31, 2018. This item is in the category "Jewelry & Watches\Vintage & Antique Jewelry\Fine\Retro, Vintage 1930s-1980s\Pins, Brooches". The seller is "dudadz" and is located in Boothbay, Maine. This item can be shipped worldwide.